Making up in part for the poor representation of the Q400 in Asia is LEPL, the business conglomerate with a footprint in Infrastructure, Power, Entertainment, Education, Hospitality and Health Care, that announced on the 22nd of February a new regional airline catering to Tier II & Tier III cities using a fleet of 5 Q400 next gen Turbo prop aircraft. 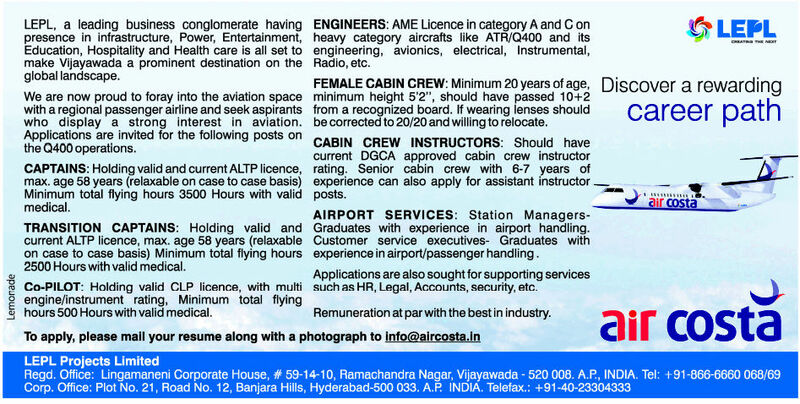 Headquartered at Vijayawada and with hubs planned at Hyderabad and Chennai, the all turbo prop airline, Air Costa, plans to start operations in either May or June in preparation for which a newspaper advertisement was brought out calling applications from Captains, transition captains, first officers, cabin crew, aircraft maintenance engineers, and other ground staff. The Q400 Next Gen’s direct and only competitor, the ATR 72-600 may have given the Vijaywada base airline’s decision makers a tough time in choosing the right aircraft for their operations. The ATR 72-600 is more economical, with the direct operating costs lower than that of the Q400. The ATR 72-600 consumes significantly lesser fuel than the Q400 per passenger, breaks-even at a lower load factor, costs 7-8 million USD cheaper to procure, and yet Air Costa chose the Q400. Three reasons can make the Q400 more attractive than the ATR 72-600: its ability to carry an additional 6 revenue paying passengers, its high performance, and most importantly, its range. Looking up manufacturer published range v/s payload charts, the Q400 and the ATR 72 can be compared on an almost level ground. Bombardier’s published data is unambiguous: They clearly specify the range is considering fuel reserves for a 100NM alternate airfield, 45 minutes of holding time, and 5% flight fuel contingency, and that the aircraft is flown in high speed cruise. ATR on the other hand puts these reserves under “JAR Fuel Reserves”. This conceals the assumptions: the distance to the alternate airfield isn’t known, and in previous brochures, an 87NM alternate was considered. 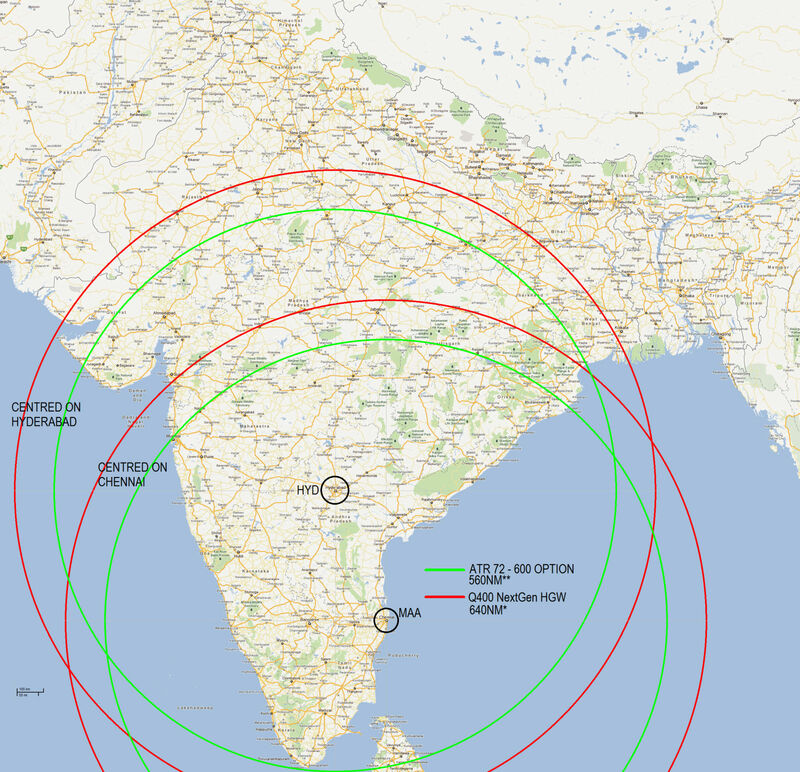 This only means that the range indicated by ATR may be lesser than projected if one is to consider a 100NM alternate. ATR 72 (left) and the Q400's (right) Range-Payload chart. Note that the Q400 chart is for High Speed Cruise, 100NM alternate, 45 hold and 5% fuel contingency, while the ATR 72's chart keeps the essential details hidden. Nevertheless, ignoring the differences and pulling out the figures still puts the Q400’s range (High Gross Weight version: the Q400 variant used by Spicejet) a minimum 80NM greater than the ATR 72-600’s (the “OPTION” that ATR offers, which boasts off greater range and weights than the “BASIC” variant), at maximum passenger load (78 X 102 = 7959kg for the Q400 and 72 X 102= 7344kg for the ATR 72-600), this maximum payload considering passengers at 102kgs each (75kg adult + 20kg check in+ 7kg cabin baggage). This 80NM makes all the difference in planning a flight from Hyderabad to Tiruvananthapuram (Trivandrum). Considering the fact that Air Costa plans to serve Tier II cities in India, there is no reason why this sector wouldn’t be considered. Spicejet operates a daily Q400 flight direct from Hyderabad to Trivananthapuram, with a scheduled block time of 2hrs 15 minutes, with Cochin as the alternate, which is around 100NM away. The ATR 72-600 on the other hand will not be able to fly direct between the city pair with full payload. Deviations due to weather, winds, and flying airways that zig-zag in varying degrees add air distance: all this combined with the 100NM alternate (Cochin) will make things tough for a flight planned on the ATR 72. The Q400’s range presents operational flexibility. A flight from Chennai to Mumbai, with Pune as the alternate may also be planned on the Q400, but not on the ATR 72. Air Costa may settle for a cabin configuration similar to Spicejet’s: 78 seat, 30″ seat pitch all economy configuration. With an all turbo prop fleet, Air Costa will enjoy the lowest fuel cost per aircraft per litre of ATF (Aircraft Turbine Fuel) amongst all scheduled operators in India, due to the non-applicability of sales tax on ATF for scheduled operation with regional aircraft of seating capacity less than 80 seats. Considering the sad fact that in India, ATF accounts for nearly 50% of operating costs, the savings cannot be overemphasised. The Q400’s flexibility in range and speed can potentially throw open an all new airline to the Indian traveller: an airline that can keep costs low, flexibility high, giving other airlines a run for their money. The timing of Air Costa isn’t bad either. With Kingfisher Airlines’ flight and cabin crew applying outside to other airlines, there may be no dearth of experienced manpower. With 5 aircraft and an average estimated requirement of 10 pilots per airplane (commanders + first officers), at least 50 flight crew members and possibly about 50 cabin crew would be needed, all of whom may easily be “sourced” from Kingfisher. In conclusion, Air Costa will operate an aircraft that will offer it immense route flexibility, while keeping costs very low. With good planning, strong political connections, and the introduction of frequent flights between Tier I cities (such as Bangalore-Mumbai, Bangalore-Chennai, Hyderabad-Mumbai, Hyderabad-Bangalore and Chennai-Mumbai), Air Costa may, if well managed, become the envied airline of tomorrow. Nicely written and a good analysis. Do check your statement “due to the non-applicability of sales tax on ATF for scheduled operation with regional aircraft of seating capacity less than 80 seats.”. To the best of my knowledge, for sub-80 seat aircraft, ATF is a “declared goods” item. This limits sales tax in every state to 4%. Further more, all AAI and the two brownfield and two greenfield airports levy negligible or zero landing and parking fees. I am not sure about RNFC costs though. ATR has allowed Bombardier to gain marketshare away from it and so far hasn’t responded to this threat. If ATR remains complacent it would be a green light for Embraer to jump in as well. So far Embraer doesn’t see a market for a third turboprop maker. BE AERONAUTICAL ENGINEER’S CAN JOIN HERE? I finished my aeronauutical engineering 2014 batch with 78%,,I am searching a job related to my studies,If any possibilities to get a job..plz inform,,..